Sometimes I get a spare picture here and there that don’t necessarily fit in posts, so here you go. The Emporium is under construction. You can read more about the Emporium here, which also relates to my Awkward Social Situation. And incidentally, my Awkward Social Situation post still remains one of the most popular posts on MYWTM. Why is that? 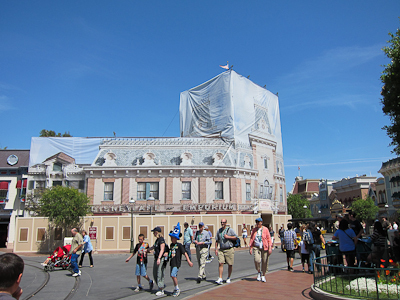 Anyway, the Emporium is being refurbished, and they’ve put a large tarp over it. But rather than just putting up an ugly green wall like they did earlier this year, they’ve put up a tarp painted to look like what the Emporium looks like underneath. I’m kind of undecided on this issue. On the one hand–so cheesy, are they think we aren’t going to notice? On the other hand, it’s a lot better than a green wall and a plain old tarp. You decide. This tarp thing is either kind of lame or kind of awesome. I can't decide. 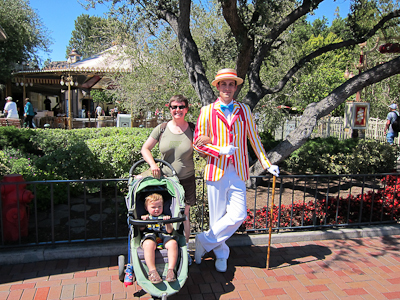 Back when I discovered the Pearly Band, I missed a good photo opportunity with Mary Poppins. However, later, I did catch up with Bert. He was very pleased that I knew who he was. Also, he insisted that I take his arm for the photo. If I ever need my chimney swept, I know who I’m calling! Is this the same Bert as the one in the Pearly Band? I don't know. The person who took that picture, by the way, was the cast members selling turkey legs. Make of that what you will. Here’s some gratuitious cuteness of a very tired Theo. It's time for my nap, Mom. Hey, it’s my blog. 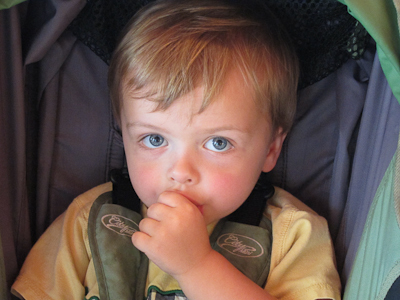 I get to show off my kid whenever I want, okay? And finally, here’s something you don’t see every day–a bride in her wedding dress. And I mean full, complete wedding dress. Is that a bride? Yes, it is! Along with the bride was her entire entourage including who I assume to be the groom in a full tuxedo. Which was kind of cool and all, but it was seriously HOT that day. They had a guided tour, and the one where you pay a lot of money and your group gets to cut to the front of the line on every ride, but still. 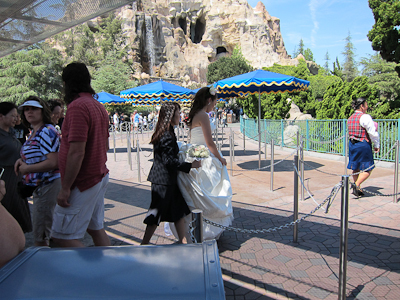 This particular bride was headed toward the Finding Nemo ride. Don't worry Nemo! I will dash out of my wedding to find you! I’m trying to think of things you could wear to Disneyland that would be less comfortable than a wedding dress, but I’m having trouble trying to come up with some. I mean, I guess walking around in a string bikini would be really uncomfortable, but they wouldn’t let you in the gate with that. So I don’t know–any ideas, fearless readers? What do YOU think could be less comfortable than a wedding dress? The only thing I can think of that would be even close would be a black shirt. Don’t mistakenly wear a black shirt on a hot day. Just my free advice. Wow, that bride! I think I would have at least changed into a short white cocktail dress better suited for a reception. 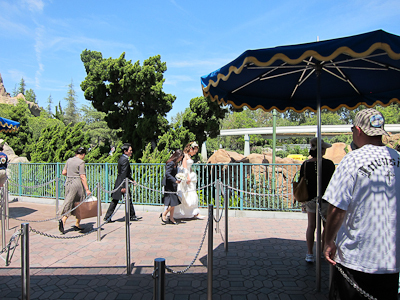 If I was crazy enough to wear my wedding attire to Disneyland, that is. I can’t wait to see your “Goth Day” pictures. They wear things that are less comfortable than a wedding dress AND it’s all black (with some purple…)! I can remember some of the 80’s formal dresses that people wore to Grad Night at Disneyland. Too bad I don’t have photos. I “stumbled” upon your blog because I heard about it on “Wait Wait Don’t Tell Me”. Great advertizing! With respect to the tent over the emporium, they do that a lot in Europe. When they are restoring a historic building, they cover it with a tarp on which is imprinted something sort of like the building underneath. It keeps the tourists happy. I suspect the same thing is happening here. I like the tarp on the Emporium! And when in doubt if it’s cheesy or not just ask WWKD? (What Would Knott’s (Berry Farm) Do?) I think Knott’s would have put up a chain linked fence where we could view workers taking a nap or on their lunch break all day. I know something that would be much more uncomfortable. I currently live in Japan and have tried on a kimono on several occasions. I am pretty sure walking around in that through Disney would not be fun. What do you think? I’m thinking that a scuba dive suit might be only slightly less comfortable than a wedding dress. The heels! Oy! I say it’s a different Bert – this one seems a bit more jaunty! Yeah, I think it was a different Bert. Wait, you mean that there’s more than one Bert? Impossible! !